The organization of the Alpha chapter of Areta (the original name for Alpha Delta Chi; the Greek word means 'virtue') on the campus of UCLA was founded in the fall of 1925 as a direct result of faith and foresight on the part of two students – Evelyn Kepple Kay and Ruth Umsted Ohly. Evelyn and Ruth felt the need for a sorority of women who were active in Christian service. They gathered a group of Christian friends who became the esteemed founders: Ruth Umsted Ohly, Evelyn Kepple Kay, Marion Wright Madden, Willard Crowder Clawson, Theta Singerland Dean, Alice Slingerland McEachern, Amy Culp, Dora Marie Showalter Goertz, Dorothea Harvey Schultz, and Alma Becker. The first annual convention of Alpha Delta Chi was held in Berkeley on April 6-7, 1939. Twenty-six representatives from the Alpha and Beta chapters, along with alumnae, attended the convention. It was at this convention that the idea of a central organization was discussed and initiated. The National Association, or Areta, was named the National Fraternity of Alpha Delta Chi, and the National Executive Advisory Board was formed. In order to become a member of Alpha Delta Chi, you must desire to fulfill all of the membership requirements. The Epsilon chapter of Alpha Delta Chi was chartered in 1949 at the University of Southern California. The chapter was declared inactive shortly after its foundation due to declining membership. In 2006, the chapter was re-chartered by a group of zealous Christian sisters entering the University as freshmen. 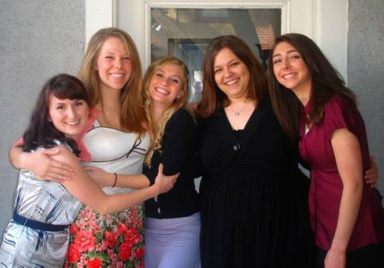 These women are pictured below (left to right): Jennifer Benbow, Heather Marie Brainerd, Loni Iverson Cariaga, Jenna Lynn Bagnoli, Lauren Levonian Kaldjian. 1. To strengthen the spiritual lives and testimonies of the members, resulting in service and outreach to others. 2. To promote higher scholastic standards among the members. 3. To provide social fellowship among the university students living the Christian life and active in Christ's service.